As territorial and cannibalistic creatures, spiders have defied our attempts to domesticate them for the purpose of harvesting their silk. But because a strand of spider silk is as much as six times stronger than steel and five times lighter, scientists have long searched for ways to replicate or mimic the production of this natural protein fiber. Trying to imagine all the possible real-world applications of readily produced spider silk can lead to fantastical ideas. It turns out, some scientists calculated a few years ago, that Spider-Man’s famous feat of stopping a runaway subway train with spider webs is not as far-fetched as it seems. 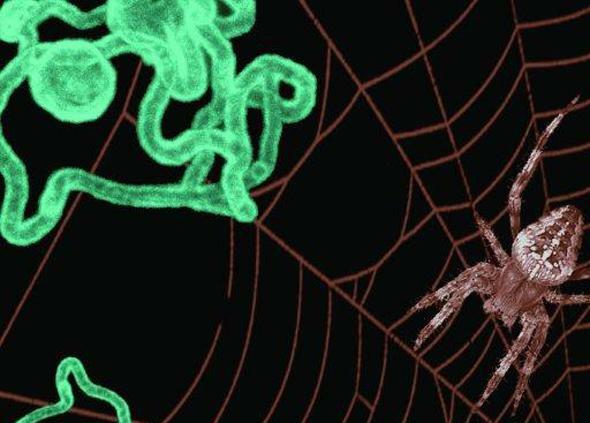 In the quest for synthetic spider silk, humans have produced remarkable new materials. But at each milestone, the copycat fiber has had at least one major deficiency. Real spider silk is not only strong, unbelievably elastic, and able to withstand extreme temperature, it is also biodegradable and biocompatible, a fact that’s especially important for medical applications. Advances in genetic engineering have allowed scientists to produce spider silk proteins using base materials like plants, yeast, or goat milk. But these biopolymers, however close to the original, are just building blocks. The truly hard part is spinning the silk proteins into fibers the way spiders do. Academic and corporate researchers have managed to force the proteins to bind using chemical processes. A spider silk startup in Jerusalem called Seevix Material Sciences Ltd. says that for all progress made in the field in recent years, it alone has replicated the process of creating spider silk. Ms. Shen declined to provide additional details on the technological innovation citing the need to protect trade secrets. But she said that the breakthrough is the result of 10 years of research conducted at Jerusalem’s Hebrew University by her chief technology officer Shmulik Ittah. The three-year-old startup is experimenting with different applications, adding the tiny fibers to nylon, rubber and other substances to create new and superior composites. Heroic slinging from Spider-Man notwithstanding, the most immediate use for Seevix’s synthetic spider silk is in medicine, specifically in tissue engineering and cell growth. The company’s first commercial product, called SVXgro, can be used as a scaffolding for cells and tissues in the process of regeneration. A company in Japan, Kurabo Industries Ltd., signed an agreement in March to market and sell SVXgro to pharmaceutical firms and research institutions working in this field of medicine. The product has yet to receive regulatory approval for use in treatment. With a price of $300 for one milligram of fiber, Seevix’s proposition is “very profitable,” Ms. Shen said. The startup has raised around $7 million to date, mostly from private investors, according to Ms. Shen.